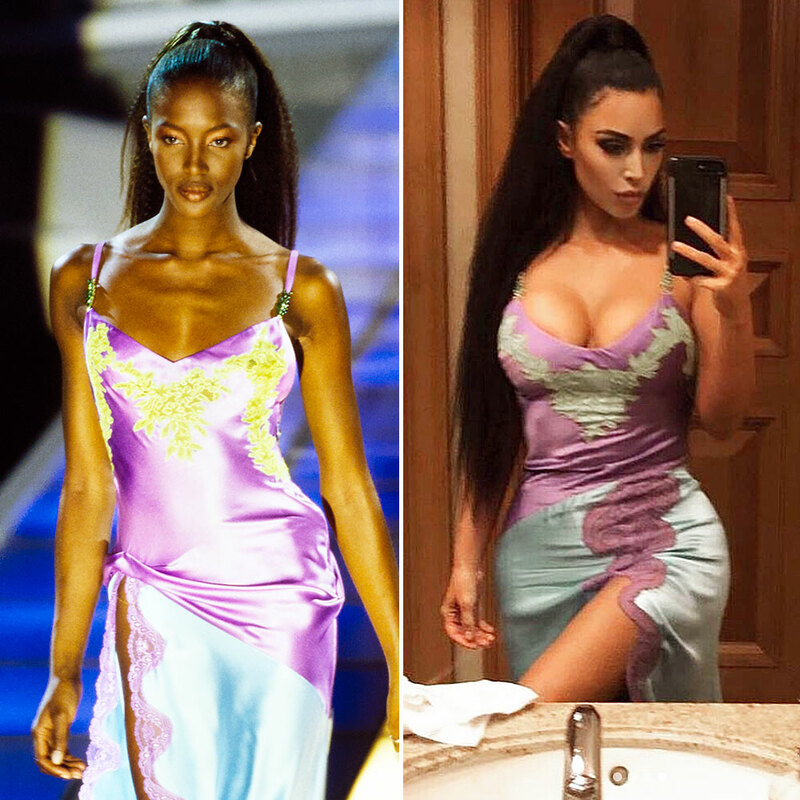 Turns out, Kim Kardashian actually is copying Naomi Campbell’s iconic style. On Monday, March 25, the Keeping Up With the Kardashians star took to Instagram to responded to the claims that she’s been stealing looks from the 48-year-old fashion legend. In a series of photos, the mom of three poses in the same Versace slip dress she was spotted wearing to Chance the Rapper’s wedding on March 9 (A.K.A. the frock supermodel Campbell originally walk in on the Versace runway in 1996). “Naomi Forever,” she cheekily wrote in the accompanying caption with a yellow heart and shooting star emoji. Though this is the look that tipped the Internet off to their matching styles, it isn’t the only one the two have shared. At The Cher Show Broadway premiere back in December 2018, the middle Kardashian sister wore a shredded silver Versace gown that the OG supermodel wore first on the designer’s runway and then again at the Fragrance Foundation Awards in 2015. The significant other of Kanye West even made headlines back in the beginning of March when she stepped out in Paris rocking a sheer animal-print jumpsuit from Azzadine Alaïa, which the British model first walked down the runway in decades before. Popular fashion Instagram Diet Prada caught wind of the story on March 12 and posted a sassy comment, reading, “Hey Fashion Nova, here’s a tip… you can just go ahead and copy any 90s Versace Naomi wore instead of secretly collaborating with Kim lol.” This snub of course refers to the troubles Kardashian has had with fast fashion brands copying the vintage dresses she wears, specifically the Mugler dress she wore to the Hollywood Beauty Awards on February 17. So while Kim may be a fashion muse for many modern day women, Campbell is her style icon. And she doesn’t care who knows it.